Imola’s Autodromo Enzo & Dino Ferrari circuit host the MXGP season finale this weekend and today was the final qualifying day of the year. Starting of their race like countless other Saturdays this year was Red Bull KTM Factory Racing’s Jeffrey Herlings and Jorge Prado as they took dominant Qualifying wins. 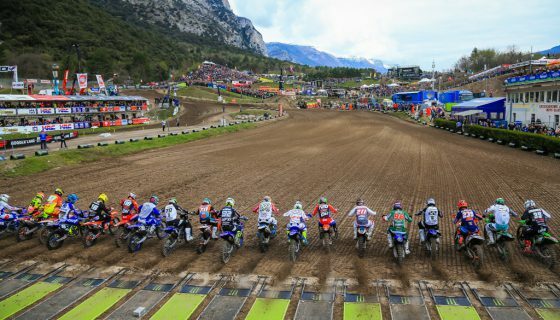 The famous Imola circuit has hosted racing events in nearly all forms and while this weekend was the first MXGP race in its history the track first hosted Motocross International races 70 years ago! 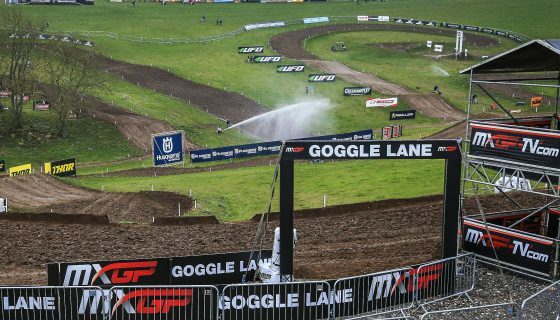 The world renowned road circuit was transformed into to a FIM Motocross World Championship track with over 25,000 cubic meters of soil brought in. With the natural elevation change of the venue as an advantage the track has already hosted great racing. 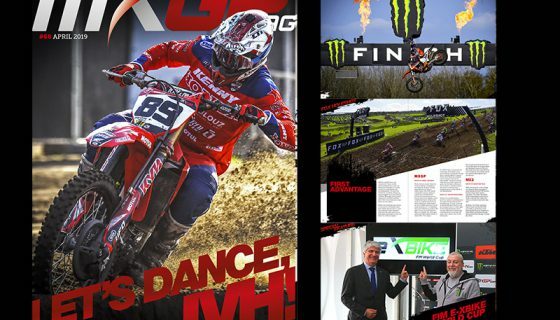 In addition to the always present MXGP and MX2 classes this weekend also hosts the season finale of both the FIM Women’s Motocross World Championship and EMX300 presented by FMF Racing. The first race of the Women’s final round was watched closely with Italian Kiara Fontanesi holding the championship leaders red plate on her MXFONTA Racing Yamaha. Fontanesi’s closest competitor Nancy Van de Ven came into the race with a 8 point deficit on the defending champion from Italy but took the lead early today and after tight racing Van de Ven took the win. Fontanesi took second and lost 3 points narrowing her gap to only 5 points for tomorrow’s championship deciding race 2. The EMX300 presented FMF Racing championship was not nearly as close as the Women’s but is still far from decided. 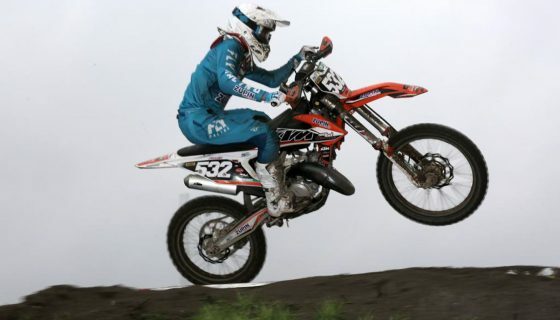 GL12 Racing’s Mike Kras was 27 points behind the championship leader Brad Anderson from Verde Substance KTM coming into the weekend. Race 1 saw Kras take the lead as Anderson struggled and dropped from 4th to 7th before finally rebounding to finish 5th. Anderson took the win with Erik Willems 2nd and Team Maddi Racing Husqvarna’s Mattia Guadagnini 3rd. The championship lead of Anderson is now down to 18 from 27 and will be decided tomorrow morning. With the championship already decided Red Bull KTM Factory Racing’s Jeffrey Herlings could have simply just taken the weekend easy but the “Bullet” is no dud and was on fire today. Starting from the Free Practice through to the Qualifying race with Time Practice between Herlings was the fastest. Taking the lead off the start and out of the first turn Herlings led the race from start to finish. Team HRC’s Tim Gajser was second but lost track of Herlings quickly while the Italian hero, Antonio Cairoli from Red Bull KTM Factory Racing, was back in 10th. Another Italian was impressing the crowd at the front however as Gebben Van Venrooy Kawasaki’s Alessandro Lupino was 3rd ahead Monster Energy Kawasaki Racing Team’s Clement Desalle and Julien Lieber. Following the 3 Kawasakis were the Yamaha triplets of Wilvo Yamaha Official MXGP Team’s Shaun Simpson, Monster Energy Yamaha Factory MXGP’s Jeremy Van Horebeek, and another Wilvo Yamaha ridden by Jeremy Seewer. 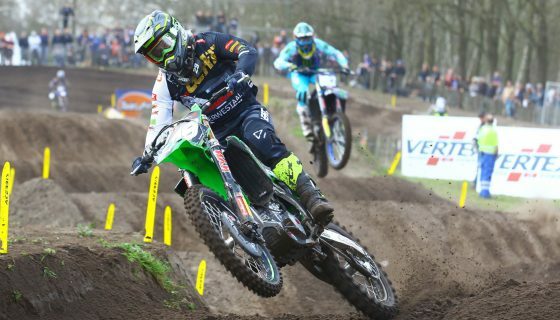 Desalle took 3rd from Lupino on lap 3 and at the same time Seewer made his way by Van Horebeek as did Cairoli. One lap later Cairoli was also past Seewer as Lupino fought Desalle to take 3rd back. Cairoli however went off track on the following lap and hit the ground hard. Slow to get up Cairoli decided to pull out of the remainder of the race but has since confirmed that he will race tomorrow. Fellow Italian and friend of Cairoli, Lupino, lost positions on the following laps to Desalle and Lieber while Seewer worked his way past Simpson to take 6th. At the finish it was a massive win for Herlings finalizing his total number of 2018 pole positions to 13. Desalle took second after passing Gajser on the final laps while Lieber was 4th and Lupino took 5th. MXGP Qualifying Race Top Ten: 1. Jeffrey Herlings (NED, KTM), 24:37.982; 2. Clement Desalle (BEL, Kawasaki), +0:23.909; 3. Tim Gajser (SLO, Honda), +0:26.654; 4. Julien Lieber (BEL, Kawasaki), +0:29.770; 5. Alessandro Lupino (ITA, Kawasaki), +0:33.970; 6. Jeremy Seewer (SUI, Yamaha), +0:34.981; 7. Shaun Simpson (GBR, Yamaha), +0:35.982; 8. Jeremy Van Horebeek (BEL, Yamaha), +0:37.879; 9. Gautier Paulin (FRA, Husqvarna), +0:45.519; 10. Kevin Strijbos (BEL, KTM), +0:48.658. 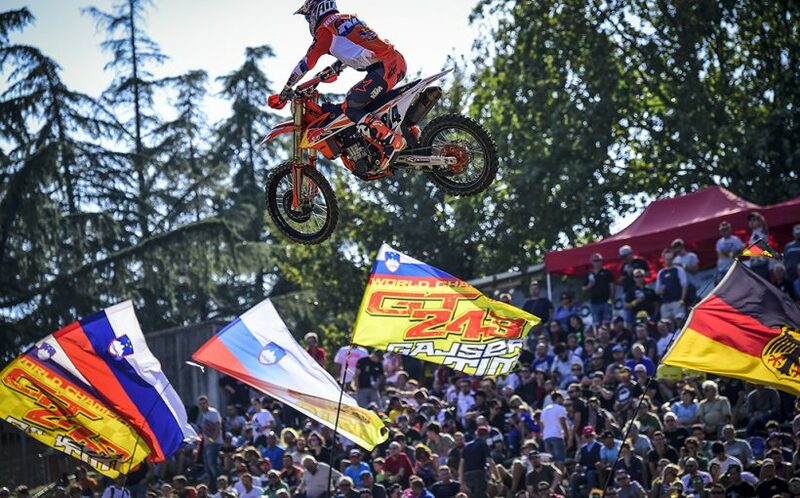 Red Bull KTM Factory Racing’s Jorge Prado came to Imola this weekend as the MX2 World Champion after learning his main competitor Pauls Jonass, also from Red Bull KTM, would be unable to race after having knee surgery. 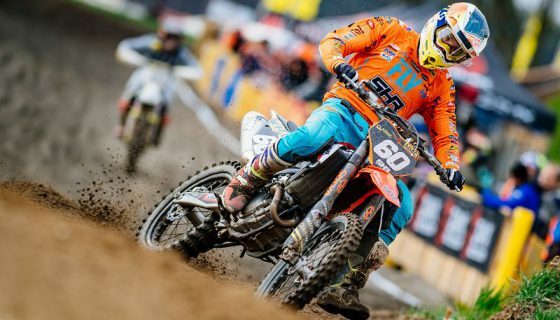 With a weekend similar to that of Herlings in the sense that he doesn’t need to push for the win Prado went out and took an impressive win today regardless. At the start of qualifying however it was Kemea Yamaha Official MX2 Team’s Ben Watson taking the first advantage and lead. The Brit and his teammate Anthony Rodriguez put Prado in a Yamaha sandwich for the opening lap but the young Spaniard was into the lead by the completion of the first official lap. Chasing down Watson and Rodriguez was Honda 114 Motorsport’s Hunter Lawrence and Yamaha SM Action MC Migliori’s Michele Cervellin. Rockstar Energy Husqvarna Factory Racing’s Thomas Kjer Olsen closed in fast though taking 5th from Cervellin on lap 2 and 4th from Lawrence 2 laps later. Rodriguez was the next to fall victim to the speed of the tall Dane as he dropped to 4th while Lawrence lost momentum and dropped to back to 7th. The Aussie rebound well though and made a handful of passes to get back up to 4th. Olsen tried to get by Watson and the two touched on the final lap sending Watson off track and slowing Olsen but the two finished 2nd and 3rd nevertheless. Prado’s win was by over a 12 second margin and sets him up perfectly to take a pair of good starts tomorrow.